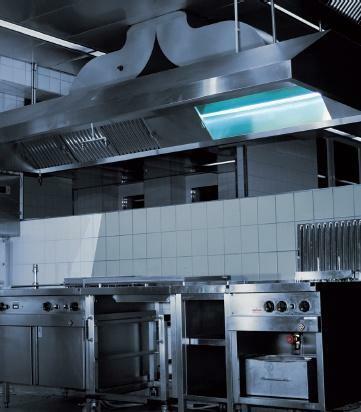 Especially in large-scale catering establishments, the use of fats and oils causes unpleasant smells and stubborn deposits in air outlet and extraction hoods. 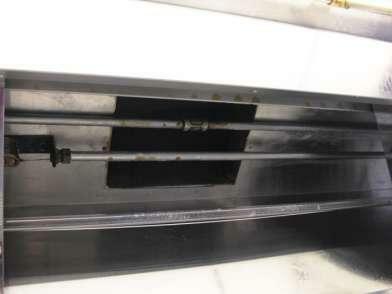 Fat separators in the kitchen air extraction hood can trap just up to 95% of the grease in the outgoing air. The rest is deposited in the hood casing and the exhaust air duct. This makes cleaning diffi cult, but above all it is unhygienic and, moreover, it is a high fi re hazard. Heraeus Noblelight has developed special vacuum UV lamps for kitchen exhaust air. In the wavelength of 185 nm (VUV), the fat molecules and odours are photolysed, destroyed and in this way neutralised. We all know it: the fumes generated by roasting and frying in the kitchen. The smell not only bites your nose, but the greasy residues it contains also leave their traces on the kitchen furniture..
Heraeus Noblelight has developed special vacuum UV lamps for kitchen exhaust air. In the wavelength of 185 nm (VUV), the fat molecules and odours are photolysed, destroyed and in this way neutralised. At the same time, the vacuum UV radiation generates ozone from the atmospheric oxygen around the lamp and that ozone is decomposed and forms excited oxygen which has an oxidising after-effect in the exhaust air duct and in this way keeps the inner surface of the duct clean. This makes cleaning of the air duct substantially easier. The Heraeus kitchen staff confi rm that while daily cleaning by hand has been necessary before, manual cleaning is now almost dispensable. The reduction of smell, which is due to the vacuum UV radiation, has already been appreciated at Heraeus, says Corinna Hoffmann, head of the Heraeus catering department. .
- "We are surprised how quickly we have noticed the positive effects of the retrofi tting. Less fat deposits, less kitchen smells ." - "The trial application of the VUV lamps was a great success and we are optimistic that other commercial kitchens will invest in this efficient technology in the future." 1 lamp instead of the common UV lamp cassette with 4-6 low pressure lamps.. In October 2010, a trial device was installed at the Heraeus canteen at Hanau. 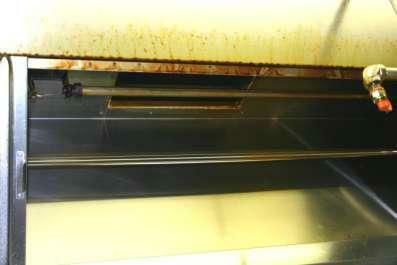 One of the extraction hoods, located directly above the deep fat fryer, was equipped with our VUV lamps. The ventilation system was installed by UV-Consulting Peschl, a long-standing distribution partner of Heraeus Noblelight. The specialist company combined all necessary components to form a retrofi t kit and developed a control system for safe operation in accordance with DIN standards (or DIN 18869-7:2006-07). The pictures on the left show the kitchen air extraction hood exhaust air duct above the deep fat fryer prior to installation (on top) and after installation of the VUV lamp after 3,000 hours of operation.